MicroStrategy rebranded its products into three distinct groups: the MicroStrategy Analytics Platform (consisting of MicroStrategy Analytics Enterprise version 9.4 — an updated version of its v9.3.1 BI suite); MicroStrategy Express (its cloud platform available in both software- and platform-as-a-service subscription options; and MicroStrategy Analytics Desktop (a single-user, BI discovery solution). 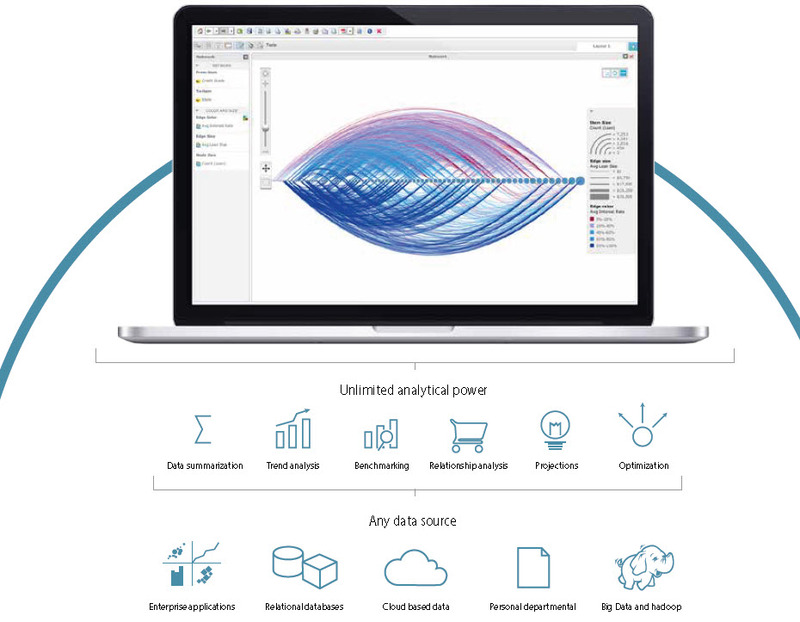 MicroStrategy Analytics Enterprise takes a page from Tableau’s book via support for data blending — a technique that Tableau helped to popularize. “We’re giving the business user the tools to join data in an ad hoc sort of environment, on the fly. That’s a big enhancement for us. The architectural work that we did to make that enhancement work resulted in some big performance improvements [in MicroStrategy Analytics Enterprise]: we improved our query performance for self-service analytics by 40 to 50 percent,” said Kevin Spurway, senior vice president of marketing with MicroStrategy. Spurway — who, as an interesting aside, has a JD from Harvard Law School — said MicroStrategy implements data blending in much the same way that Tableau does: i.e., by doing it in-memory. Previous versions of MicroStrategy BI employed an interstitial in-memory layer, Spurway said; the performance improvements in MicroStrategy Analytics Enterprise result from shifting to an integrated in-memory design, he explained. Spurway described MicroStrategy Desktop Analytics as a kind of trump card: a standalone, desktop-oriented version of the MicroStrategy BI suite — anchored by its Visual Insight tool and designed to address the BI discovery use case. Desktop Analytics can extract data from any ODBC-compliant data source. Like Enterprise Analytics, it’s powered by an integrated in-memory engine. In other words: a Tableau-killer. The company’s strategy is that many users will, as Spurway put it, “need more.” He breaks the broader BI market into two distinct segments — with a distinct, Venn-diagram-like area of overlap. “There’s a visual analytics market. It’s a hot market, which is primarily being driven by business-user demand. Then there’s the traditional business intelligence market, and that market has been there for 20 years. It’s not growing as quickly, and there’s some overlap between the two,” he explained. Many in the industry view self-service visual discovery as the culmination of traditional BI. In Spurway’s view, the usefulness or efficacy of BI technologies shouldn’t be plotted on a linear time-line, e.g., anchored by greenbar reports on the extreme left and culminating in visual discovery on the far right. Visual discovery doesn’t complete or supplant traditional BI, he argued, and it isn’t inconceivable that QlikTech, Tableau, and Spotfire — much like MicroStrategy and all of the other traditional BI powers that now offer visual discovery tools as part of their BI suite — might augment their products with BI-like accoutrements. Instead of a culmination, Spurway sees a circle — or, better still, a möbius strip: regardless of where you begin with BI, at some point — in a large enough organization — you’re going to traverse the circle or (as with a möbius strip) come out the other side. There might be something to this. From the perspective of the typical Tableau enthusiast, for example, the expo floor at last year’s Tableau Customer Conference (TCC), held just outside of Washington, D.C. in early September, probably offered a mix of the familiar, the new, and the plumb off-putting. For example, Tableau users tend to take a dim view of traditional BI, to say nothing of the data integration (DI) or middleware plumbing that’s associated with it: “Just let me work already!” is the familiar cry of the Tableau devotee. However, TCC 2013 played host to several old-guard exhibitors — including IBM Corp., Informatica Corp., SyncSort Inc., and Teradata Corp. — as well as upstart players such as WhereScape Inc. and REST connectivity specialist SnapLogic Inc. These vendors weren’t just exhibiting, either. As a case in point, Informatica and Tableau teamed up at TCC 2013 to trumpet a new “strategic collaboration.” As part of this accord, Informatica promised to certify its PowerCenter Data Virtualization Edition and Informatica Data Services products for use with Tableau. In an on-site interview, Ash Parikh, senior director of emerging technologies with Informatica, anticipated MicroStrategy’s Spurway by arguing that organizations “need something more.” MicroStrategy’s “something more” is traditional BI reporting and analysis; Informatica’s and Tableau’s is visual analytic discovery. “Traditional business intelligence alone does not cut it. You need something more. The business user is demanding faster access to information that he wants, but [this] information needs to be trustworthy,” Parikh argued. “This doesn’t mean people who have been doing traditional business intelligence have been doing something wrong; it’s just that they have to complement their existing approaches to business intelligence,” he continued, stressing that Tableau needs to complement — and, to some extent, accommodate — enterprise BI, too. “From a Tableau customer perspective, Tableau is a leader in self-service business intelligence, but Tableau [the company] is very aware of the fact that if they want to become the standard within an enterprise, the reporting standard, they need to be a trusted source of information,” he said. Among vendor exhibitors at TCC 2013, this term — “trusted information” or some variation — was a surprisingly common refrain. If Tableau wants to be taken seriously as an enterprisewide player, said Rich Dill, a solutions engineer with SnapLogic, it must be able to accommodate the diversity of enterprise applications, services, and information resources. More to the point, Dill maintained, it must do so in a way that comports with corporate governance and regulatory strictures. Stephen Swoyer can be reached at stephen.swoyer@spinkle.net.